I am still in Kraków and it is July 2017. Over the years, I had accomplished all Kraków excursions of my “Müller guidebook”, except number 12 “Las Wolski” (wolf forest). I try to do the excursion to the forest on a hot Thursday. But I do not get far, as I get stuck in the pavilion of Bronislaw Chromy – discovering him is too attractive. I take bus 192 at the Cracovia Stadium. 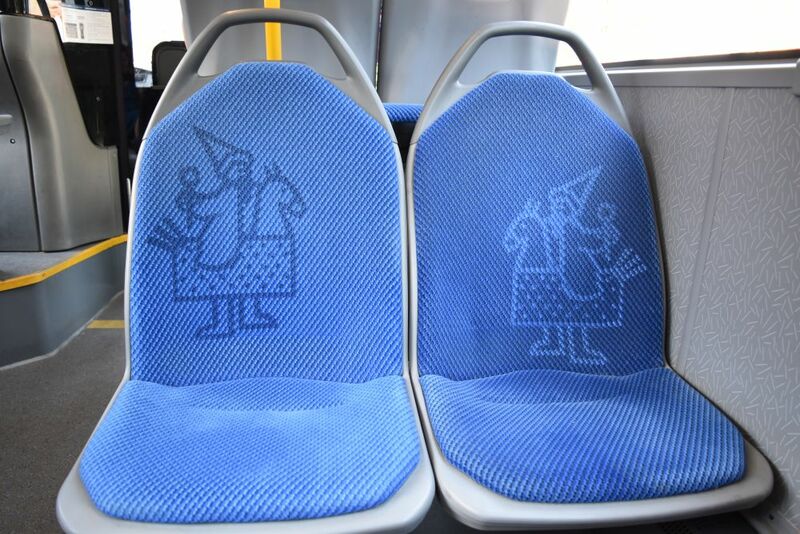 More Lajkoniki are welcoming me in the bus! One of the bus stations on the way is called Lajkonika. Perhaps it was here that the Mongols had been defeated by the Krakówians in the 13th century? I leave the bus at the station “Park Decjusza”. I oscillate a bit to find the park that the bus station is named after. A friendly man explains the right way to me. I am so proud that I understand him (he spoke Polish). In the park, I come across a lady that lies flat on the grass meditating while more ladies are thoughtfully grouped around her. Is this a place of strength? Oh, I understand, I have found the Willa Decjusza that now provides conference rooms. These ladies might be relaxing from a meeting. The Willa is a Renaissance building. The Park Decjusza is wild and shady. Great for a hot day. Cyclists are passing by. In the middle of the park, I find this pavilion surrounded by sculptures that are beautifully embedded in nature. 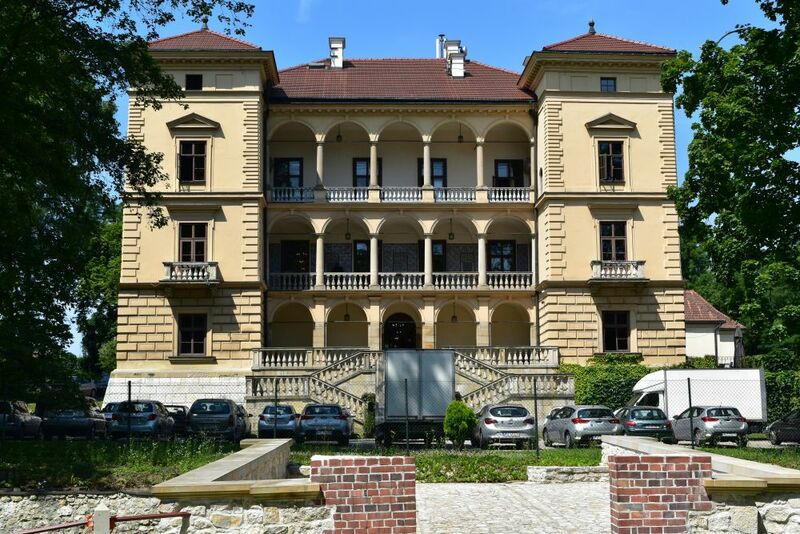 It is the pavilion of Bronislaw Chromy. It find it difficult to capture the sculptures with my camera. 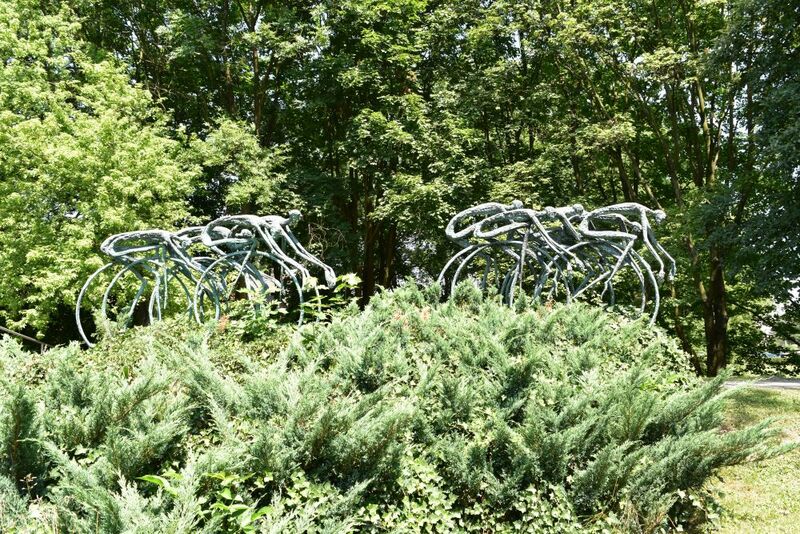 These are the cyclists on the Juniper bush. They are almost swallowed by the bush and the trees. 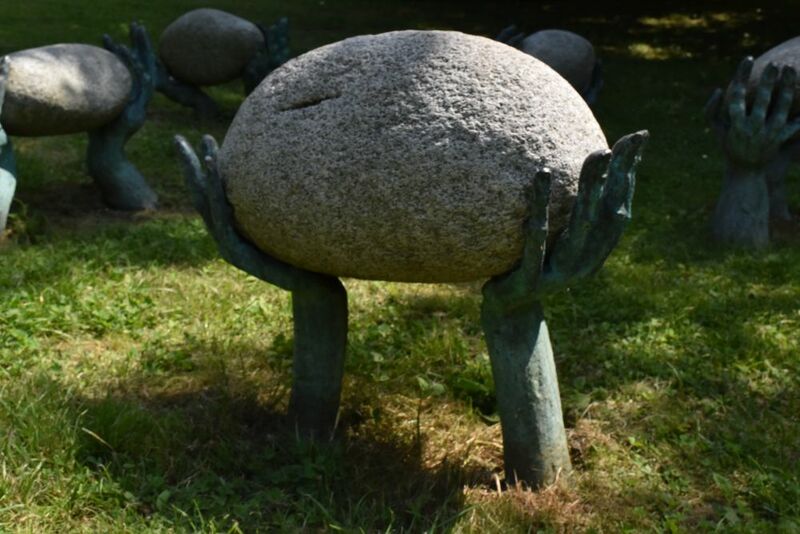 The hands holding a rounded stone show harmony. Mother Earth seems to give support . Inside the pavilion, a friend of the family of Bronislaw Chromy serves coffee and self made cake. He gives me a book and, when reading it, I start to understand. Bronislaw Chromy, born in 1925, is a very well-known contemporary artist in Poland. His sculptures can be found all over in Kraków: He created the dragon (or smok) under the Wawel that spits fire (the dragon is loved by children from all over the world). He also created the monument for the dog Dzok that after the death of his master kept on waiting for him. 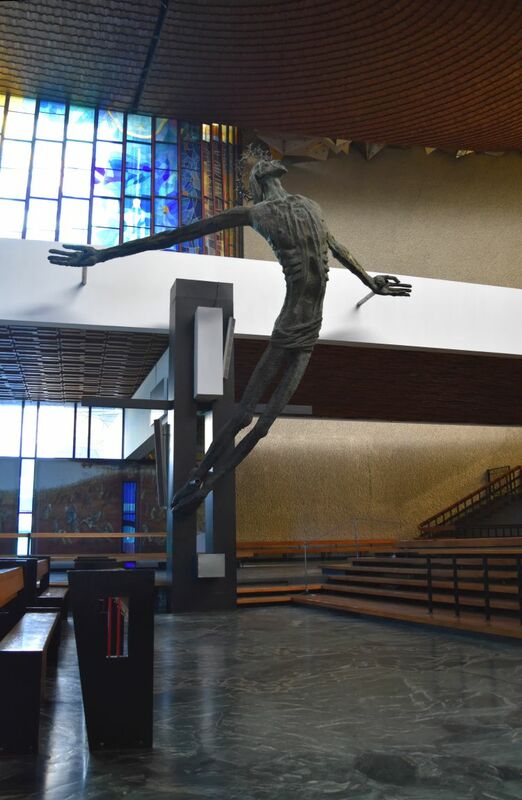 And he is also the artist that made the impressive Christ in Nowa Huta – the Christ that is being crucified while ascending to heaven at the same time. Born in 1925, Bronislaw Chromy is an old man now. The family friend managing the pavilion talks with deep respect about the “professor”. 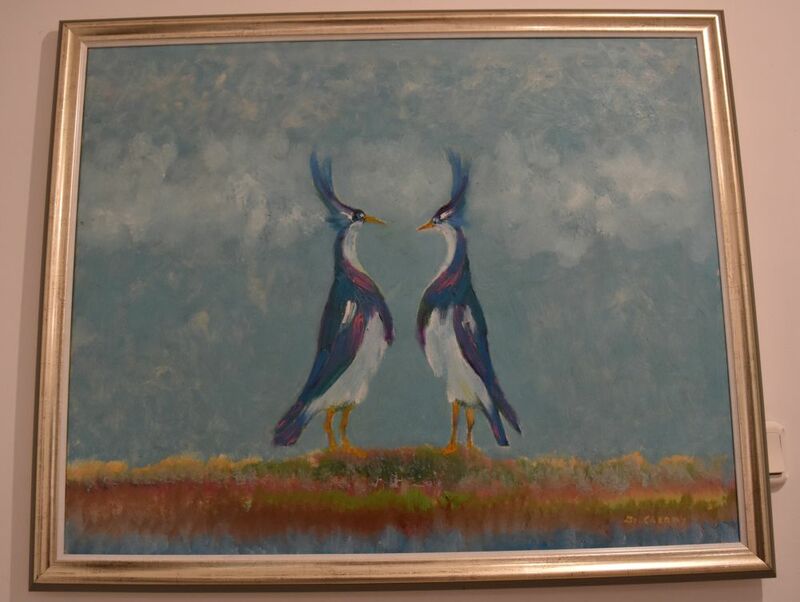 In the cellar I find charming paintings made by him such as these two birds – they may be about to attack one another. 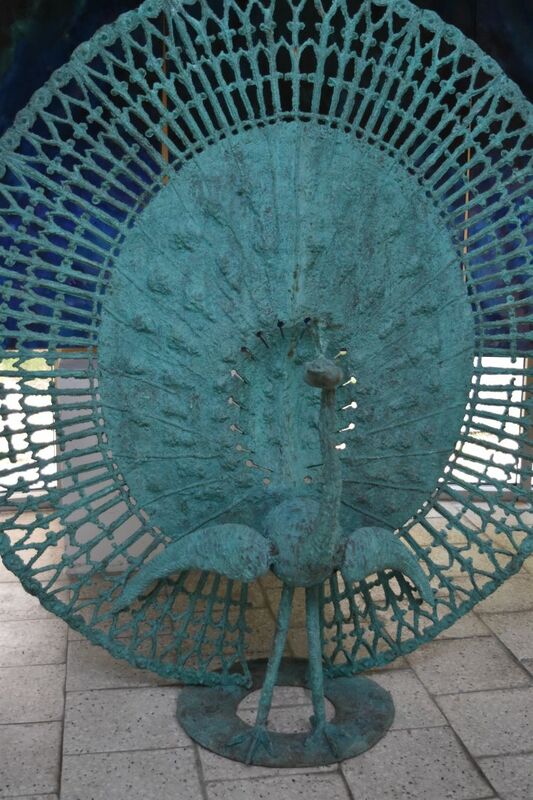 The pavilion sells sculptures of Chromy such as this is peacock. Back in Kraków I look for Chromy’s owls in the Planty near the Wawel castle. Here they are – a friendly mum with two cheerful young owls. From the owls, I walk around the corner to have a salad in the Bona in Ulica Kanonicza while thinking over my day. I am happy to have discovered Bronislaw Chromy who is a gifted sculptor. And I may have to finish the walk number 12 of “my Müller guidebook” when returning in December – to see the Las Wolski (or wolf forest). Now it is time to say good-bye Krakow. Another day in Kraków in July 2017. Today the weather is sweltering. Fortunately I have bought a linen summer dress at the Rynek that I am now wearing. It is so hot and humid that it is a great day for museums. After some shopping, I visit two of them, and in between I meet more friends, for lunch and for an aperitif in the evening. Not far from my hotel Wawel in Poselska I get stuck in a cute bookshop in Ulica Bracka. It is called “De Revolutionibus”. They serve coffee and cake and have many nice books for children. 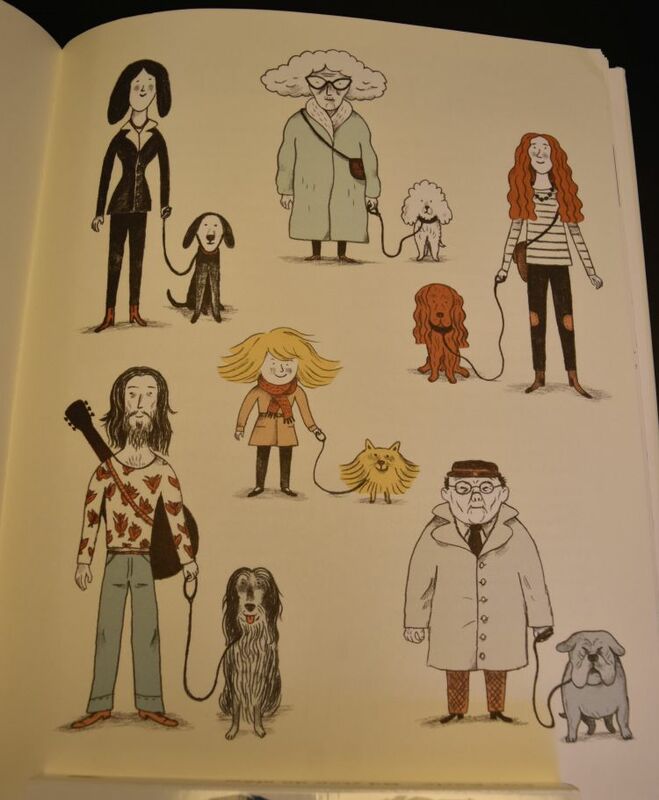 I particularly like the book about cats and dogs. Look, how dogs resemble their masters. Source: Antonio Fischetti and Sébastien Mourrain: “Psy i koty pod lupa naukowców”, Polarny Lis. 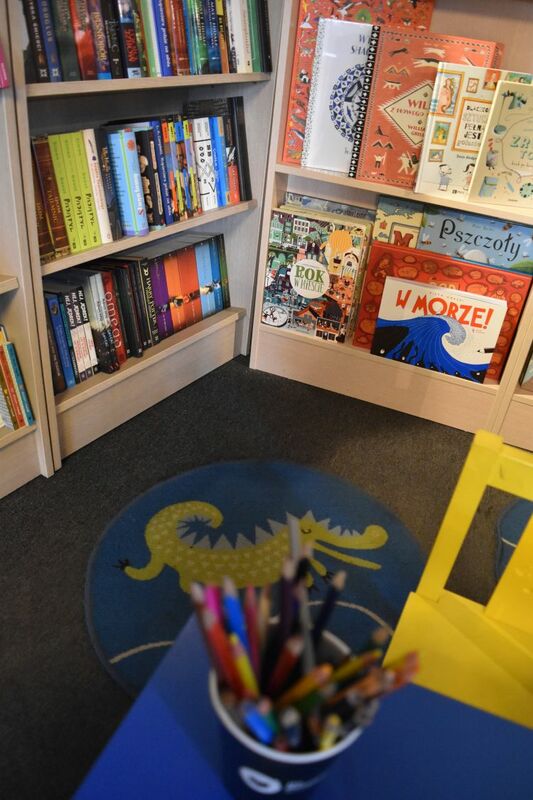 This is how the bookshop has set up the corner for children. I buy “the wedding” written by Wyspiański. He was a painter AND an author. Agata tells me later that she read and analyzed this book at school. Next Iook for information about Wyspiański. However, I cannot find an exhibition about this Krakówian multitalent in the museum named after him. Instead I find a special exhibition of paintings produced by prisoners in Auschwitz and Birkenau. Some were ordered by the SS to decorate houses or to illustrate orders to the prisoners. Others have been painted in secret showing the atrocities of the concentration camps. And some are memories of the life outside the camps – they were painted to give hope that one day, they might be free again. I am particularly impressed by the drawings of a formerly famous skier that had painted the mountains with and without skiers. I am suffering of what the Germans that I am sharing roots with have done… I always feel guilty and I am not able to take one photo. 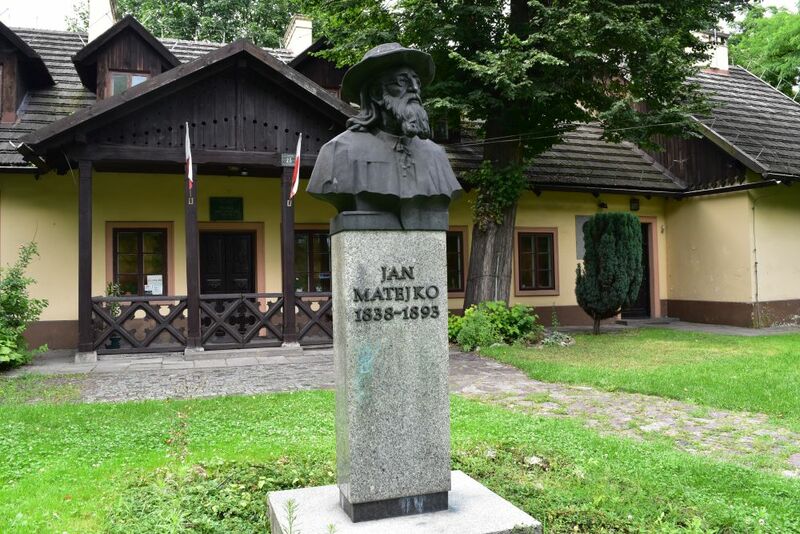 I had found out about Matejko, when visiting Nowa Huta and Krzeslawice. He had a cottage near the lake of Krzeslawice which is now a museum. He was born and lived most of his life in Florianska 41, not far from the Rynek. 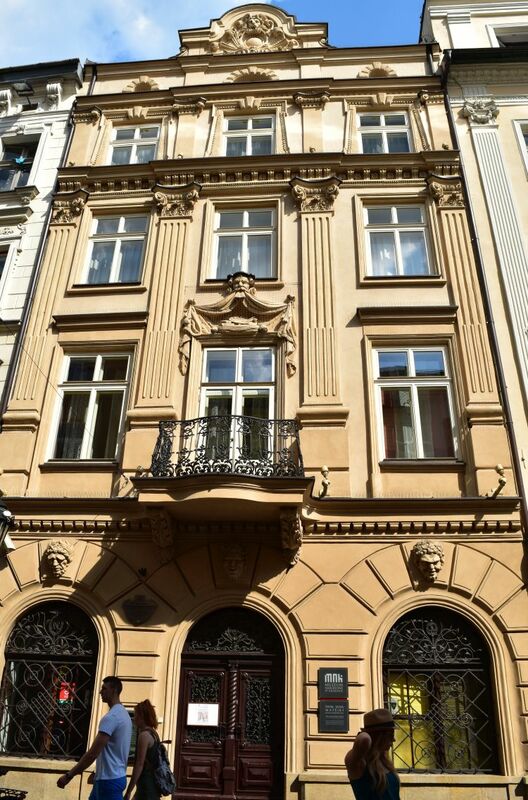 Florianska 41 is this neoclassical building that has been renovated by adding modern style elements. Matejko was born in 1832 to become an important Polish painter of the 19th century. He engaged to remind the Polish of their identity and culture, when Poland was ruled by foreign forces after 1792. 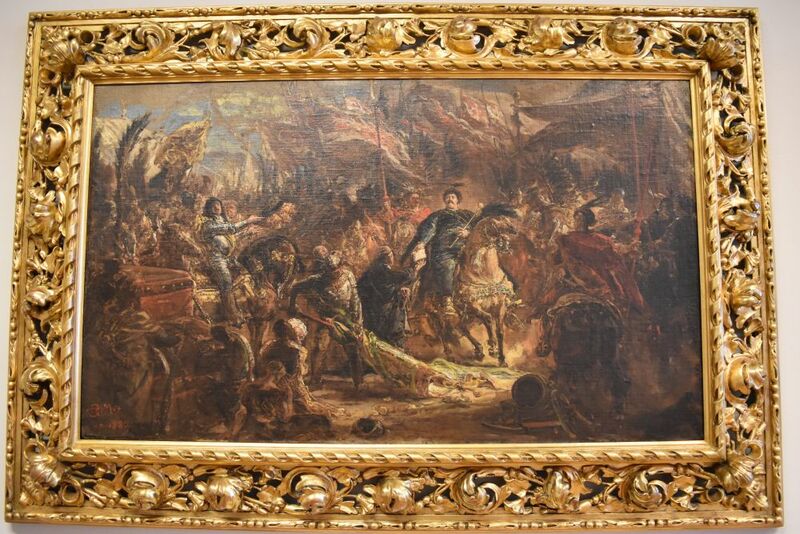 He was famous for painting historical scenes such as Sobieski vanquishing the Turks in Vienna in 1683. It is said that his paintings helped the Polish to keep up their spirit of resistance. In addition he painted portraits and cartoons. He was a professor at the academy of arts. One of his pupils was Wyspiańsky. I go back to the shady courtyard of the Magia to have a fruit juice and meet Agata. Later I move to the Bona, a bar-bookshop in the Kanoniczka street and have a nice dry Muscat from Poland. While I am reading, I am listening to a beautiful female voice singing opera arias in front of the twelve apostles of the Saint Peter and Paul church. This is what the place looks like later in the night. 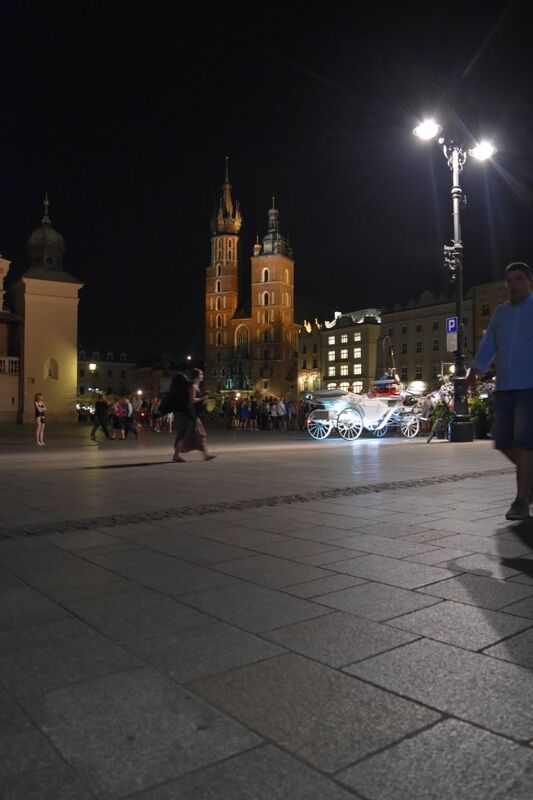 Warm summer evenings in Kraków are a very relaxing experience! I return to the Rynek (Main Market Square) and listen to a violin player. 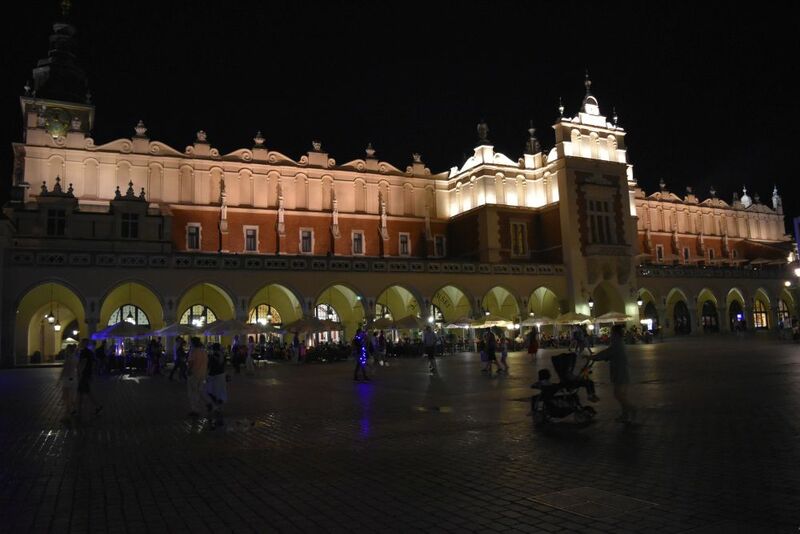 Look at the Sukiennice in the middle of the Rynek…. 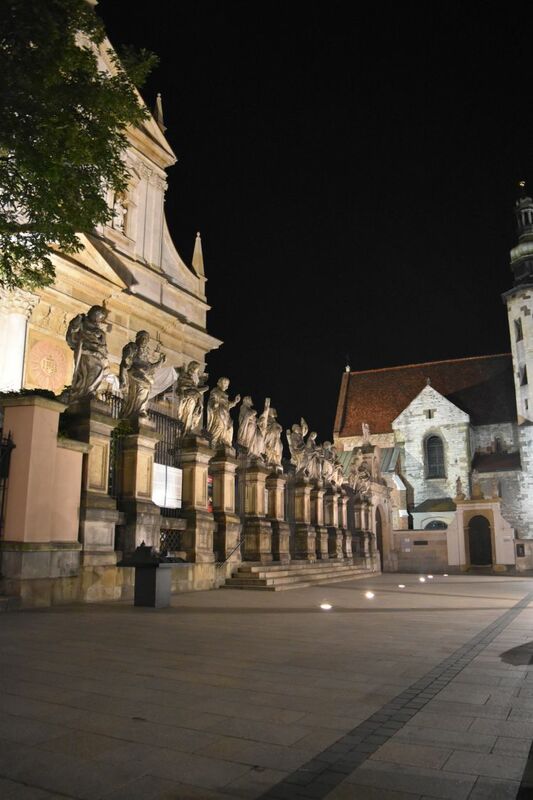 … and at Maria Church (Kosiól Mariacki) illuminated in the night. I finish off my quiet evening with a Zubróvka (bison grass vodka) in my favorite coffee bar, the Magia, just behind Maria Church. In July 2007, I spend a few days in Kraków attending a wedding, meeting friends, visiting places I like and seeing some new ones. 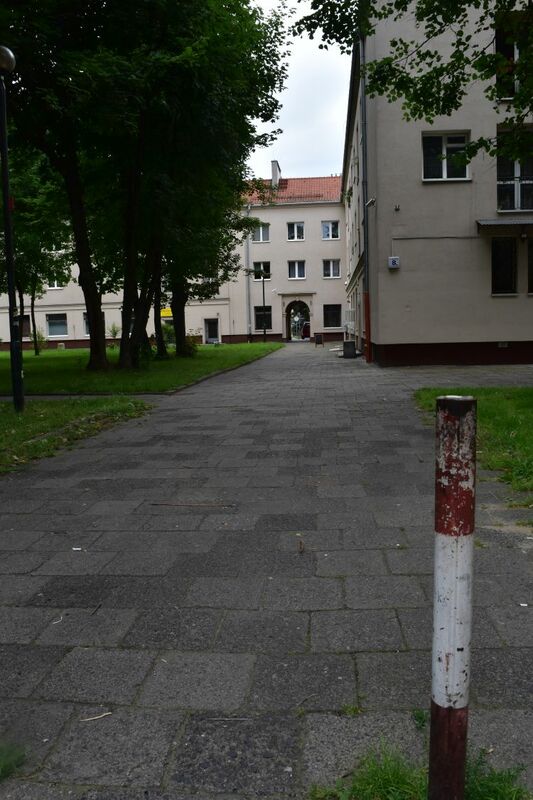 Nowa Huta – shall I really go there? One such new spot I visited is Nowa Huta. So far I have not been interested in socialist buildings made out of precast concrete slabs. 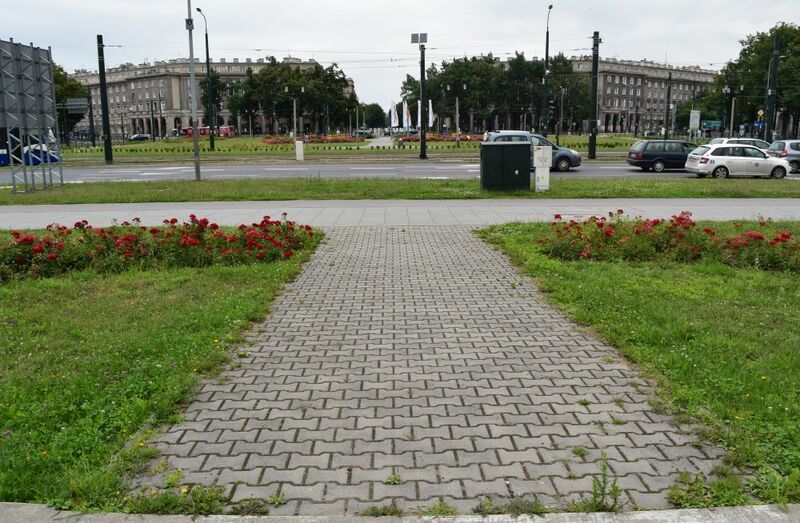 “You have not been to Nowa Huta? Then you should go. 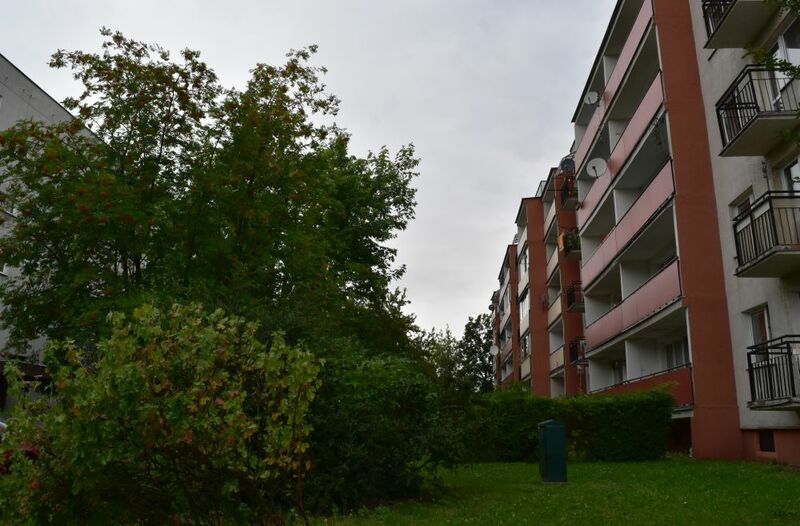 There are a lot of green alleys and parks and much space between the houses”, Radek says proudly. Maybe you are right? 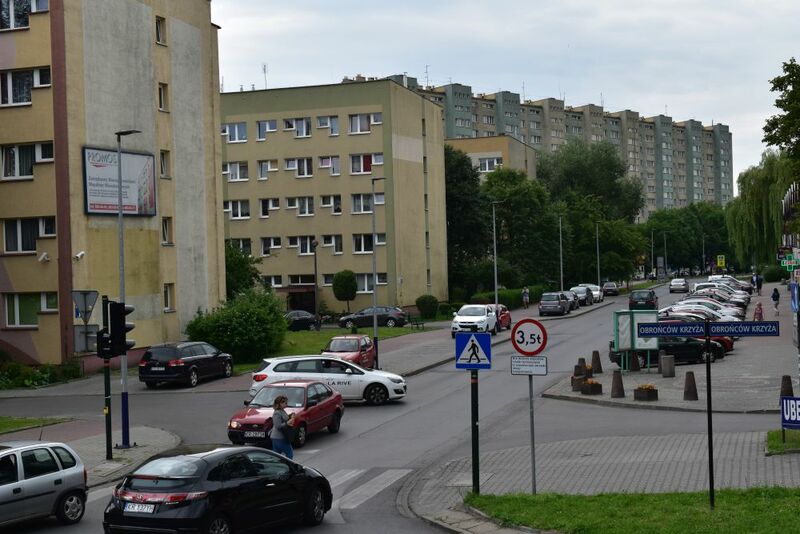 As Fidel Castro ONLY visited Nowa Huta, when coming to Krakow, I could give it a try as well. So – I went and liked this socialist invention. Wide alleys start from a large square named after Ronald Reagan. 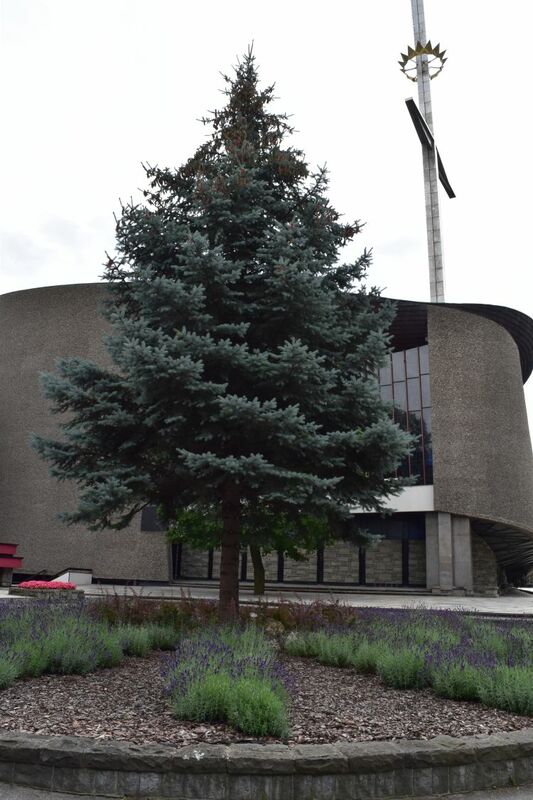 In addition to the socialist traces, I discover two gorgeous modern churches, a monastery and two wooden churches. My guide is the guidebook that Radek and Piotr had given to me some five years ago: Magdalena Niedzielska and Jan Szurmant, “Krakau”, Michael Müller Verlag 2011. Starting problems: Where is the station of tram no 4? My guidebook and the Internet say that tram no 4 goes to Nowa Huta. I find a tram station in front of the main station and buy a ticket at the ticket machine. Then I wait. No trams here. Very suspicious. A family from Denmark also looks for that tram no 4. A young Krakowian tells me that the trams leave in the tunnel. Which tunnel? With the Danish family we start to look for that tunnel. After having oscillated around and after having asked again, we find a busy tunnel, two levels BELOW the main train station. Here we board on to tram no 4. (Later I find out that I could have caught tram number 4 just on the east side of the Planty, much closer to my Hotel Wawel). We sit down in tram no 4. My neighbours leave the tram some stations later and what do I see? Two Lajkoniki. Looking at me from the seats. And near the exit, there is another Lajkonik. They are all over in Kraków and you notice them, when you know the history: When attacking Kraków in the 13th century, the Mongols were defeated. The Krakówians put on the Mongolian cloth and celebrated their victory over the Mongols. They still do so today at Corpus Dei in June – and by placing small Lajkoniki all over in their city. Yes, we have reached the central square named after Ronald Reagan. 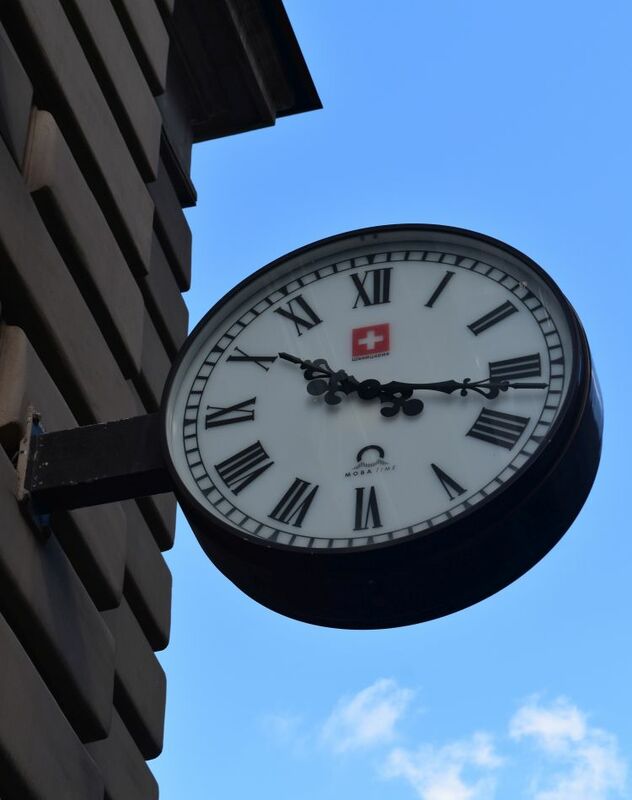 The square is spacious and surrounded by buildings that copy the pride of a classical antique style. 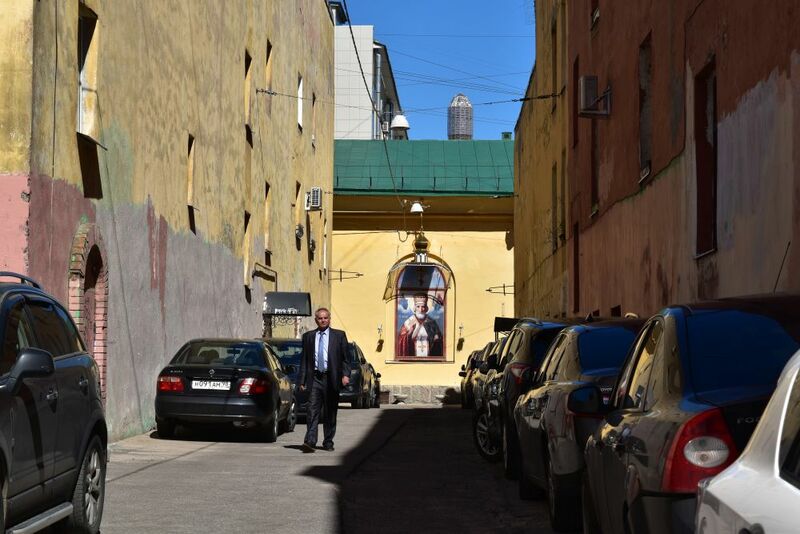 After a coffee and a delicious cernik (cheese cake), I follow John Paul II’s alley. Indeed, there is much green space between the mostly well renovated houses with passages leading to more gardens and more houses. 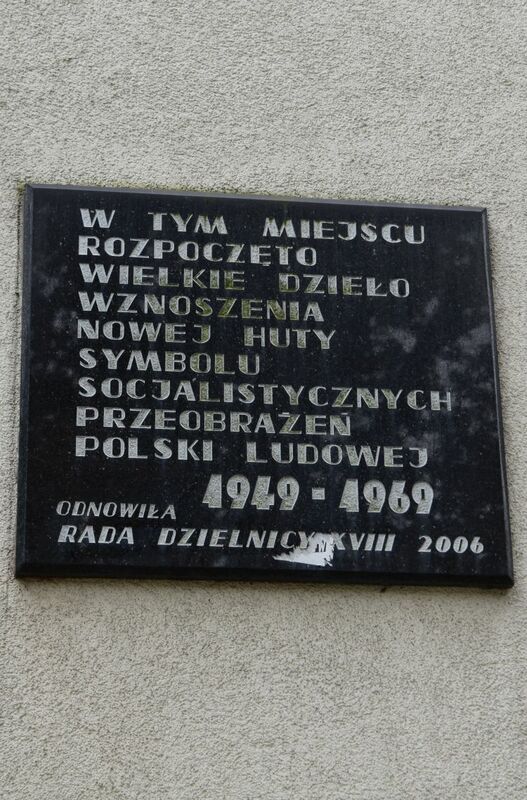 House no 14 (Ulica Mierzwy) was the first Nowa Huta building, as this plate proudly indicates. If only my “Müller” would not have this habit of judging with his nose in the air… what I have seen from Nowa Huta, is by far not that bad! 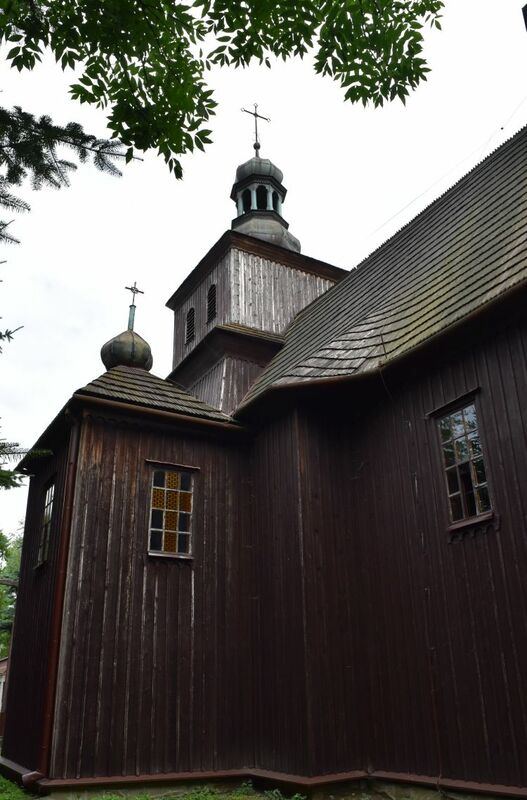 There has been life in Nowa Huta before the socialist times, as the church of Saint Batholomeus from 15th century proves (Kośiól sw. Bartlomieja). The door is open. Inside I find nice paintings – my “Müller” says that they are Rokoko. 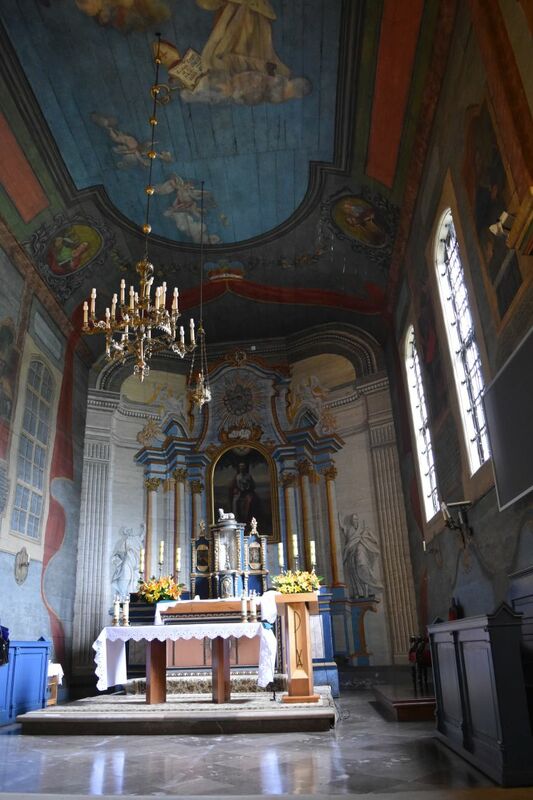 The altar is a trompe-oeuil painted on to the wall. Across the street I find the Monastery Opactwo Cystersów Mogíla. The church welcomes me with a baroque facade. 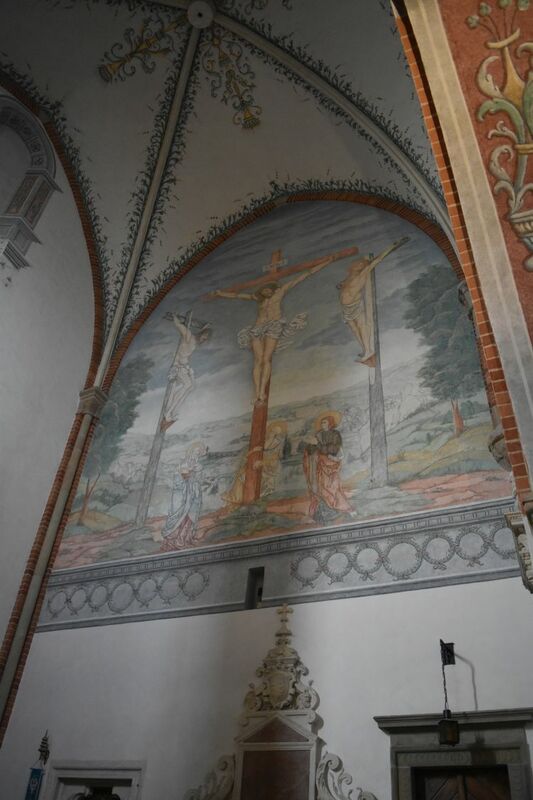 The interior is gothic from 1477, with some frescos. .
Mogíla – that sounds like “grave” to me. 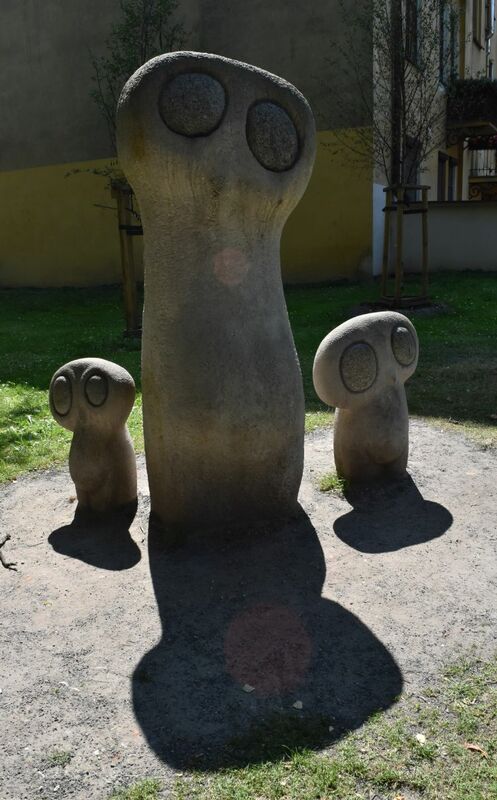 Yes, that is correct, as I learn later from Adam Bujak: “There is a burial mound named after Princess Wanda, who according to legend threw herself into the currents of the Vistula river to avoid marrying a German.” (“The Cracow Millenium”, Bialy Krk 2014, p. 9). Her mound is just behind the monastery – I will look for it the next time. The socialist government had carefully planned Nowa Huta, but being atheists they had not foreseen to build churches. 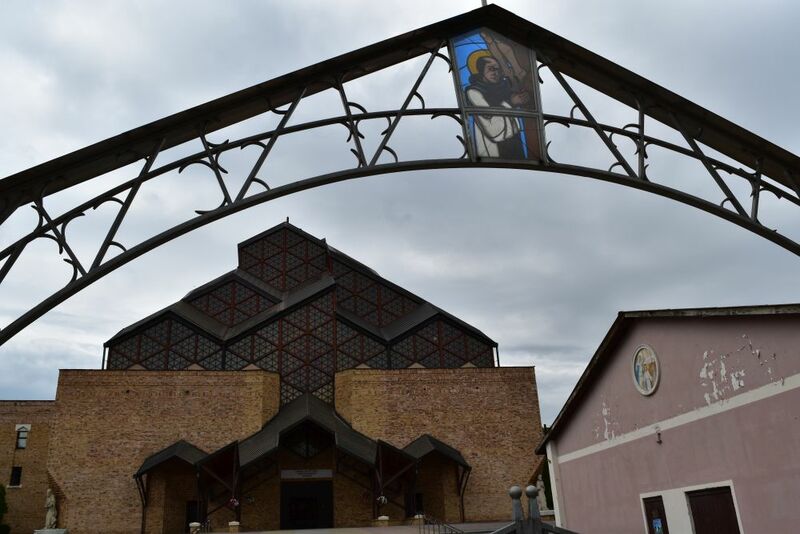 The Krakówians fought for their churches and the result are two beautiful modern churches. 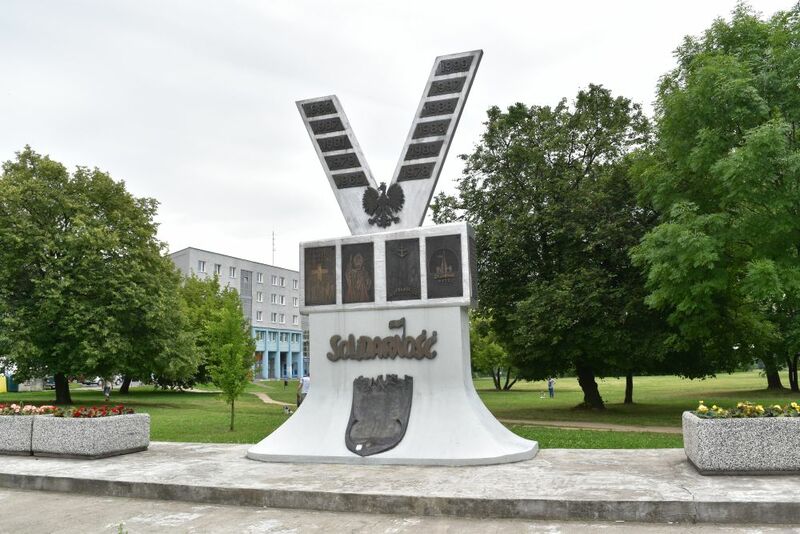 The first one is called Mother God of Tschenstochau (Kościól Matki Boskiej Czestochowskiej), located where the army had practiced before. 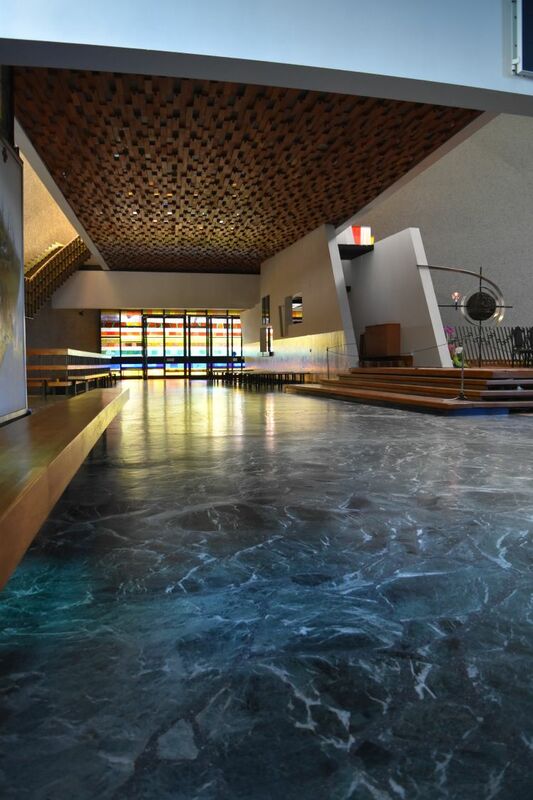 The interior is bright and makes me meditate. 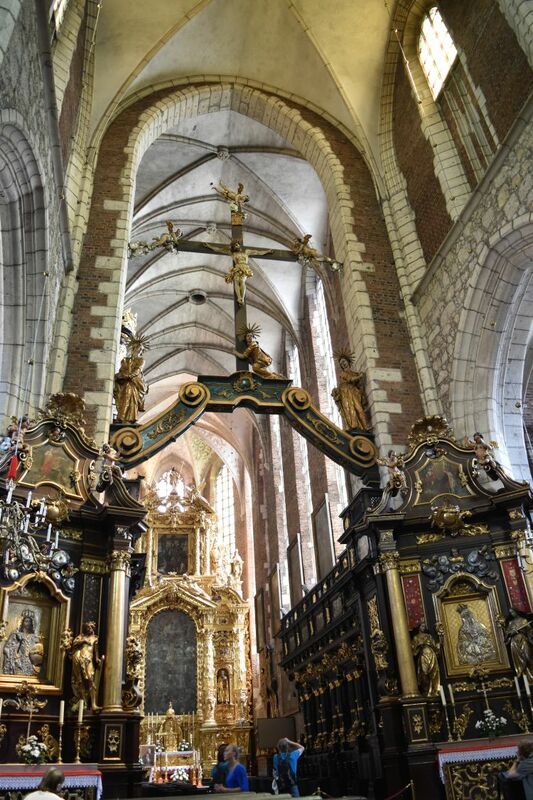 The second church is called Ark of the Lord (Kościól Arka Pana) or also Church of Our Lady Queen of Poland, consecrated in 1977 (Karola Wojtyla was the Archbishop of Kraków at that time). Inside I find two levels. Concentrated praying is going on on the ground floor. 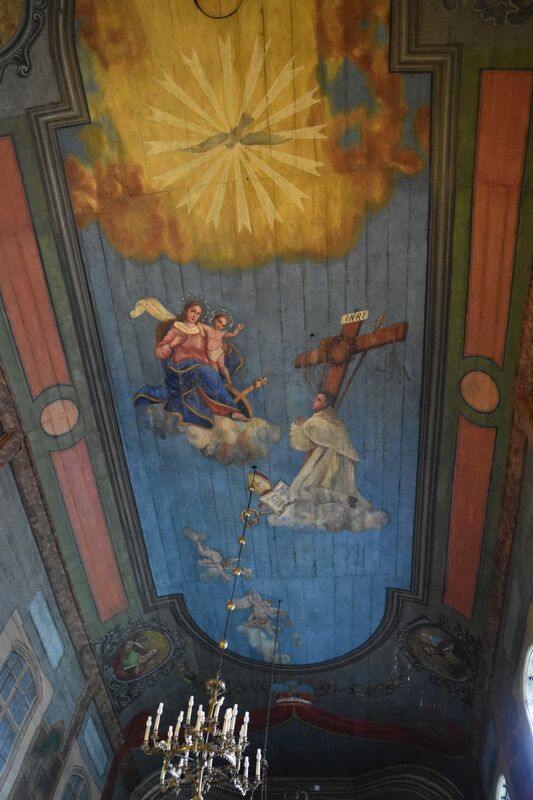 On the first floor the painted windows and the statue of Christ provide a mysterious atmosphere. Christ is almost flying away, as if Crucifixion and Ascension were to happen at the same time. Beautiful. 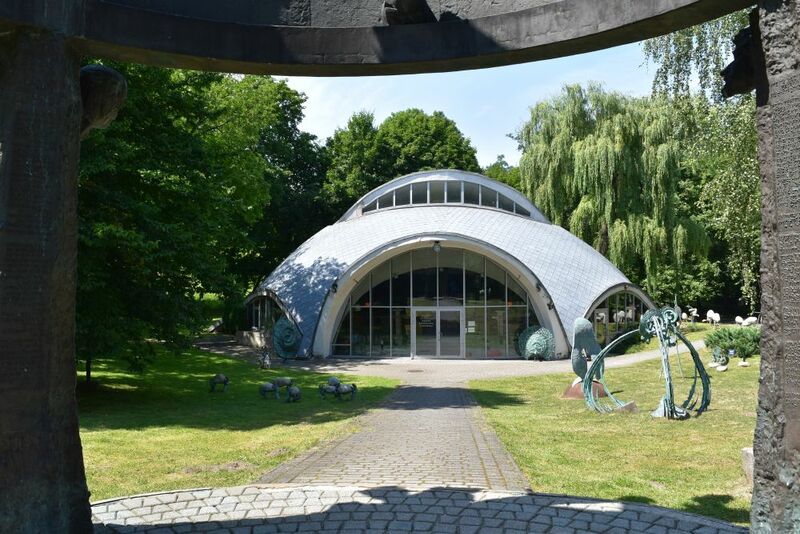 It was Bronislaw Chromy who has created this sculpture, as I learn later, when visiting his exhibition and pavilion in the north of Kraków. 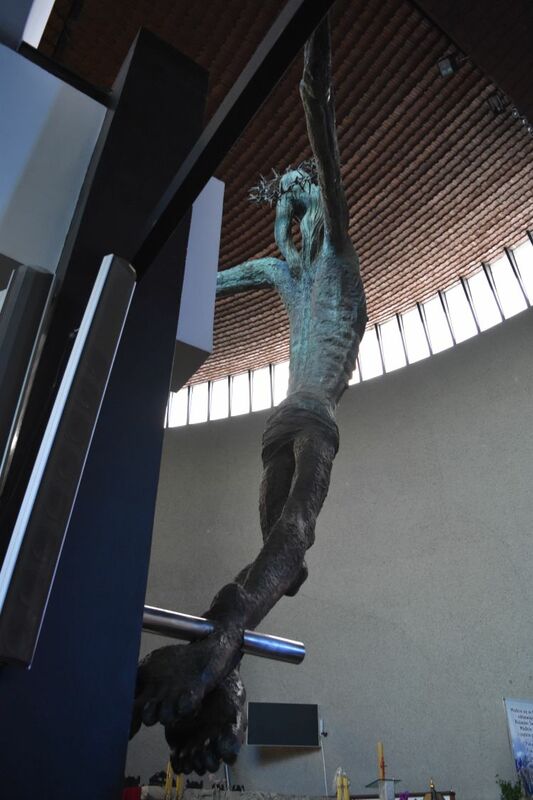 I think that this Christ is a symbol for the will to fight for freedom that the Poles have proven over and over again – and I hope they will prove it now and in future once more. 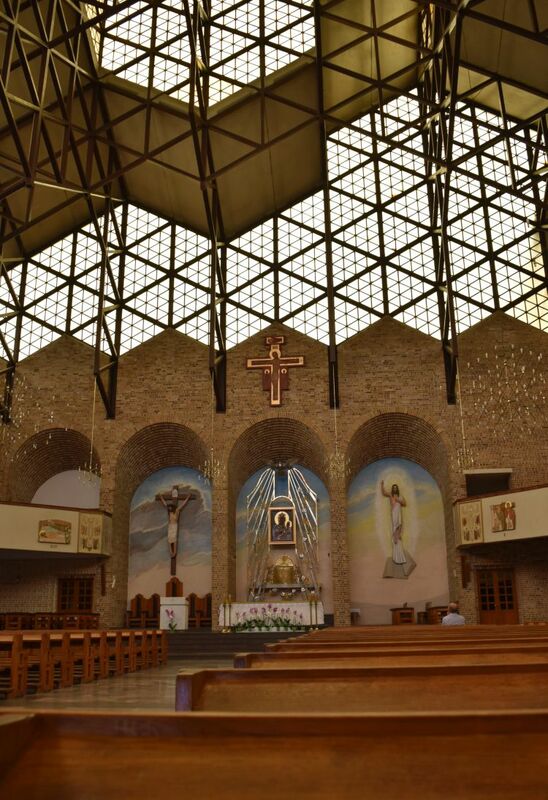 The crew of Apollo 11 gave a rutile cristall from the moon to this church. It is now in the tabernacle at the front. In the distance I see some large houses probably from socialist times. 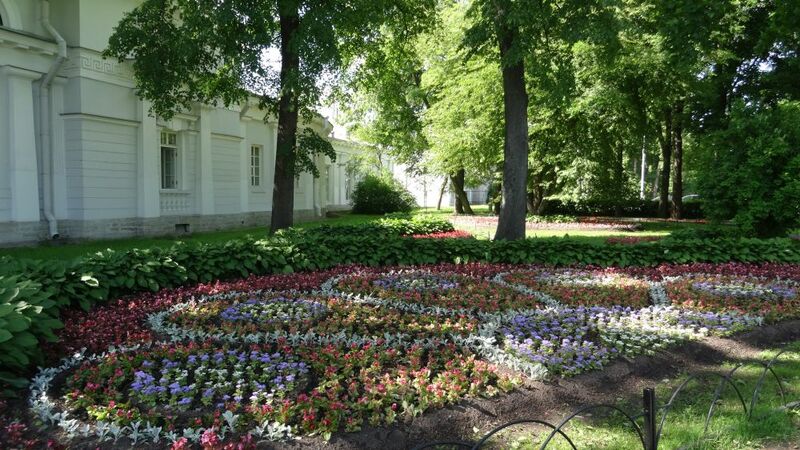 But most of the houses I come across are well renovated and, Radek was right, they are surrounded by green gardens. 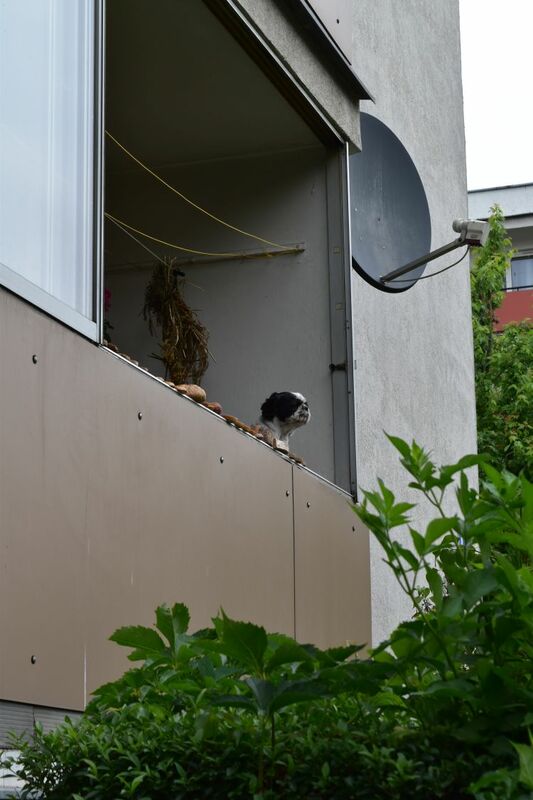 When strolling along Fatimska and Bulwarowa street, I come across this happy dog that watches his territory. 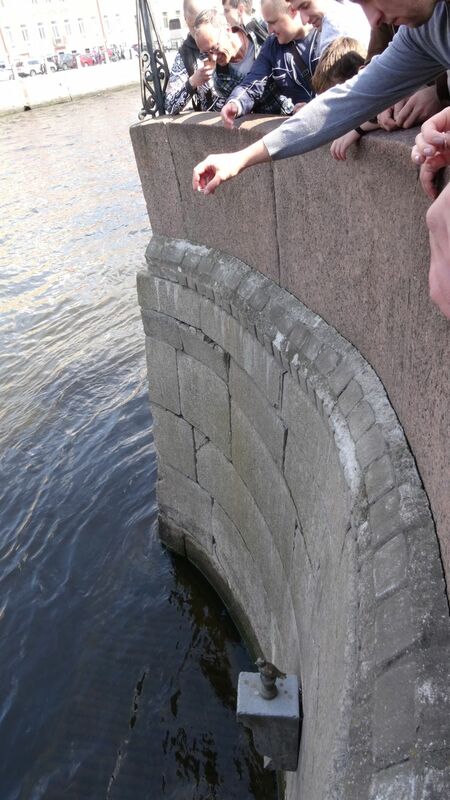 Finally I reach the small lake of Krzeslawce with childrens playgrounds. I walk around that lake and stop in front of the museum for the painter Matejko. It is closed now, as it is one of those Mondays, where all museums are closed. 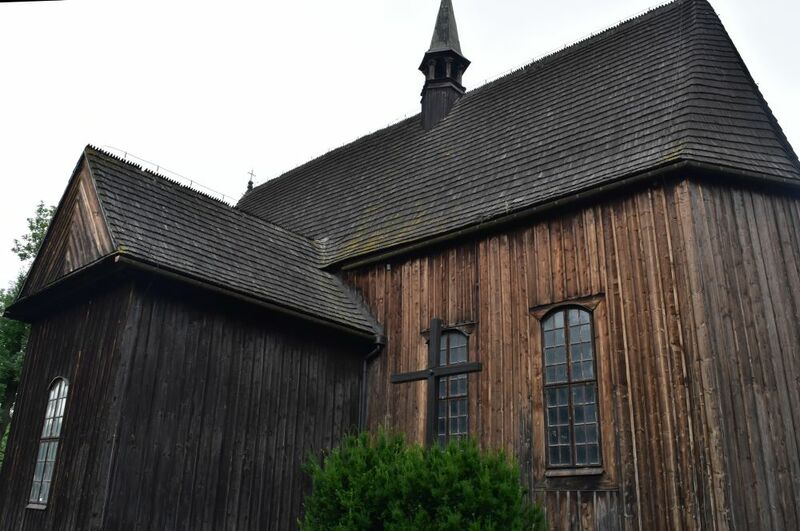 Around the corner, I take a picture of another wooden church dedicated to Saint John the Baptist (św. Jana Chrzciciela). Unfortunately it is closed. I walk back through this friendly area of Kraków to catch tram number 4 in Struga and to return to the city center. I finish off my day with three friends on the roof top restaurant Malecon with the great view of the Wislaw or Vistula river. When returning to Kraków in July 2017, I attended a wedding, met friends and visited “old” and “new” places. Let me start with Kazimierz. In winter I saw many wooden boats parked along the shore of Zwierzyniec. Now I can see, what they are for. 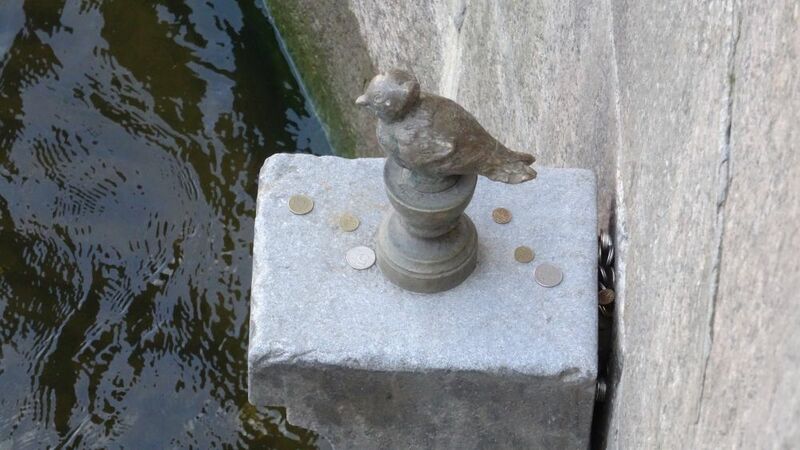 They are waiting at the peer under the Wawel, until they have 12 passengers. Then they start for a half hour ride on the Wisla. Great, I start the day with a boat ride. 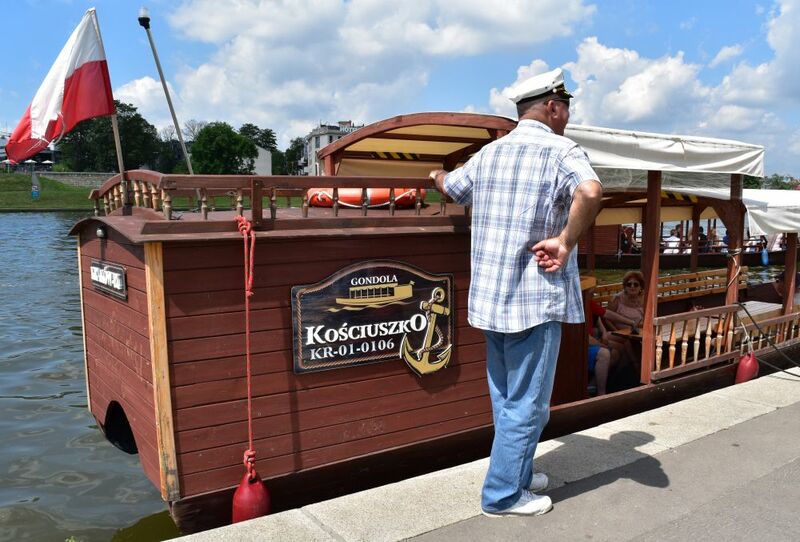 I enter the boat called Kościuszko – after the man that fought for freedom of Poland around 1800 and is now buried on a hill above Kraków. Two friendly ladies (probably my age) offer mint toffees to me. Another boat is called “Lajkonik”. 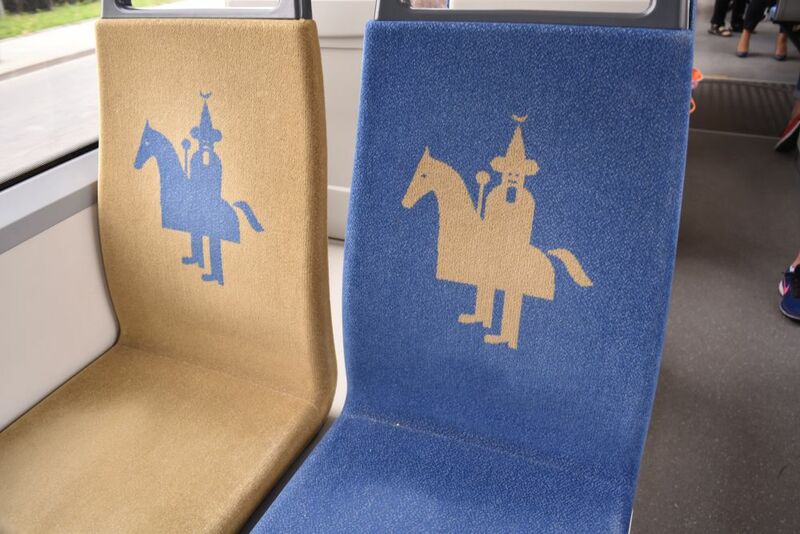 Yes, the horse riding men making fun of the Mongolians vanquished in the 13th century are omnipresent in Kraków. From the boat ride, I take back this great view of the Wawel castle. 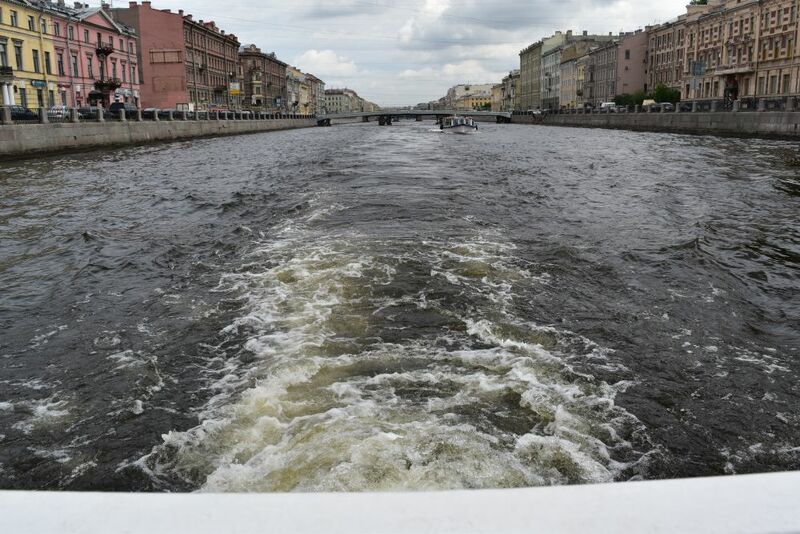 After my boat ride I follow the Wislaw and enter Kazimierz from the south. Often I have walked by the church of Corpus Dei in Kazimierz. Now I enter it. The church is an example of brick gothics, built in the 14th century. I like the cross hanging in the nave. At Józefa street I find a cosy courtyard, where I eat a zurek (sour soup). 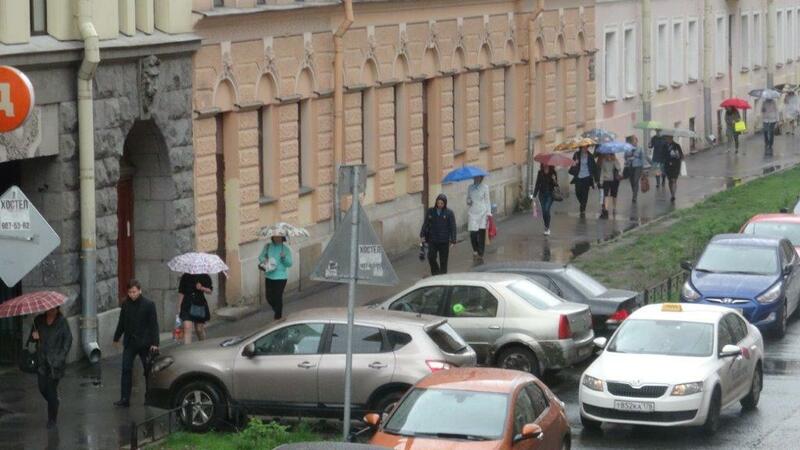 Not far from here is the high synagogue or Synagoga Wysoka that I had never taken notice of before. The synagogue is called “high”, because the praying hall is on the first floor or “high” up. 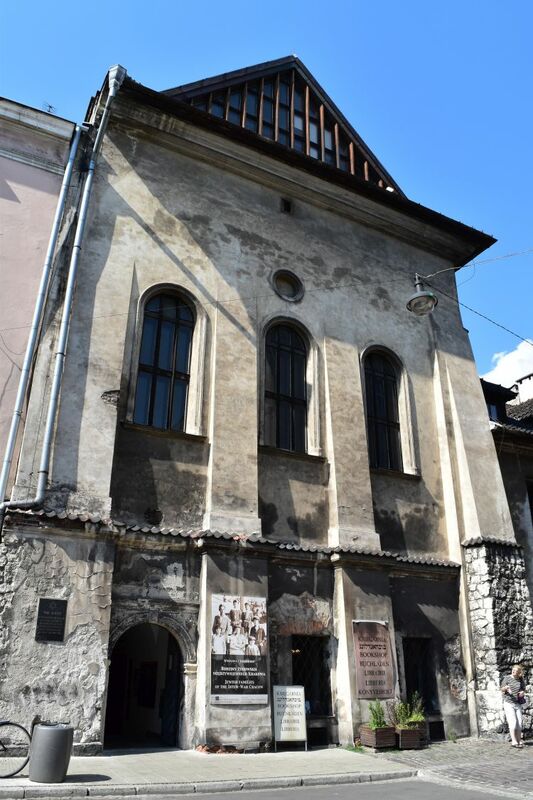 This synagogue has been built in the 16th century. In the praying hall some of the former wall decoration is left. 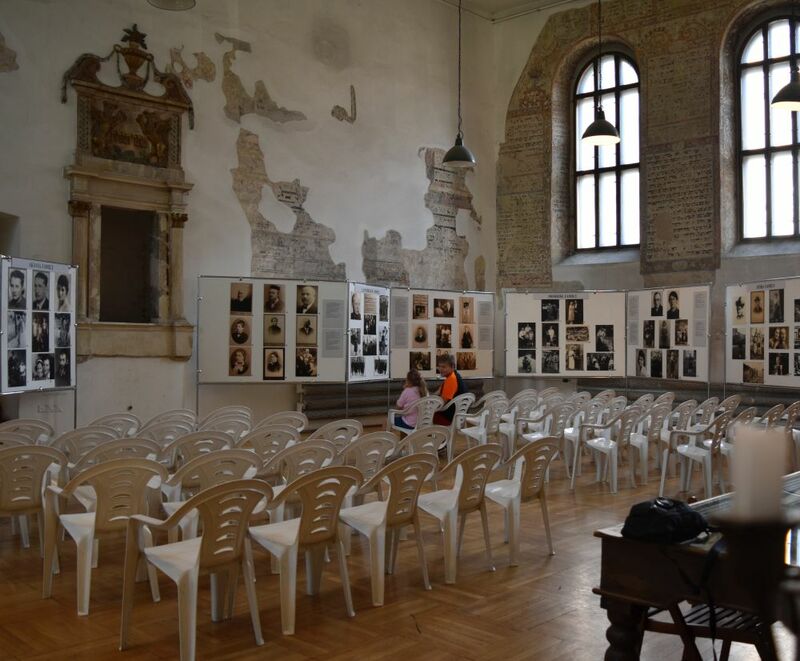 There is an exhibition of photos that show the normal Jewish life in Kazimierz before World War II. I am suffering – why has all this happened? It is hot today. 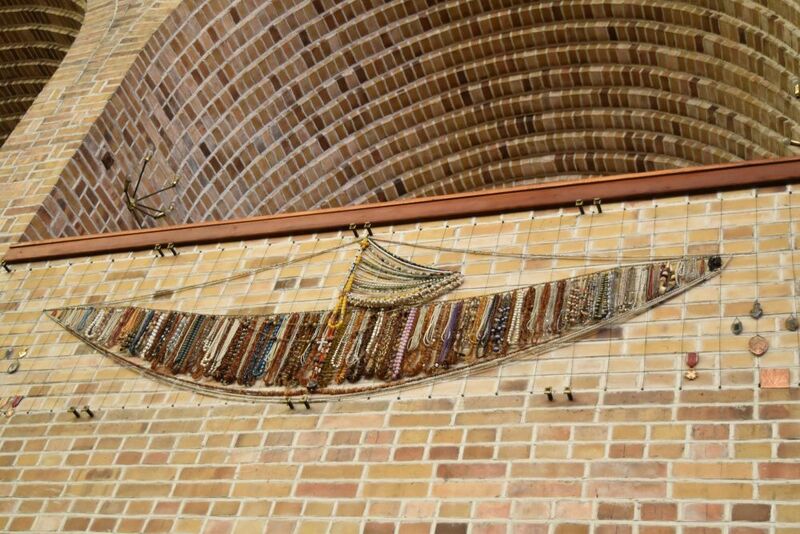 I look for a chilly place and escape into the Ethnographics museum that is located in the former townhall of Kazimierz. 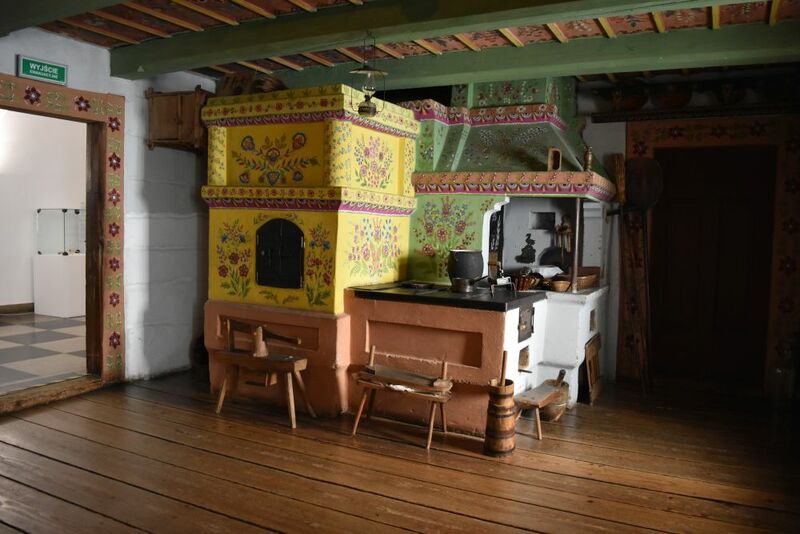 The museum has only few English explanations, but the exhibits are pretty straightforward – houses, barns and mills as well as photos and requisites that illustrate the life from craddle to grave in the 19th century. I understand that family and village life was important for the Polish that struggled to preserve their culture and language, while being ruled by Russia, Germany and Austria in the 18th and 19th century. 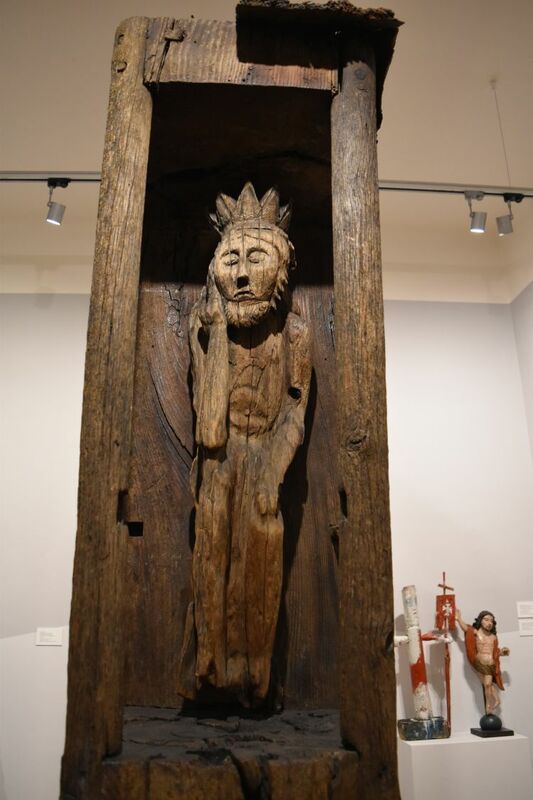 The top floor shows artifacts like this wonderfully carved Man of Sorrow from the 17th century. I finish off the day in my favorite tea house of Kazimierz, the Czajownia. Then I meet Radek for dinner. We eat in the restaurant Trezo, where I have a delicious pike perch with a Riesling from Poland. Yes, Poland grows wine as well.